Singing show tunes and "America the Beautiful" next to letters spelling "TREASON" in front of the White House, several Broadway stars lent their voices on Monday to the latest protest against Donald Trump's presidency. Actress, comedian and TV personality Rosie O'Donnell, who has had a decade-long feud with Trump, joined about 30 singers and musicians in rousing renditions of stage staples including "Everybody Rejoice," from The Wiz, and songs from Les Miserables and other productions. 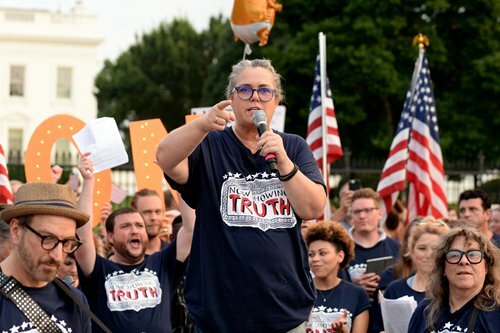 The presence of Emmy Award winner O'Donnell, 56, lent star quality to the series of protests outside the mansion's gates, where resisters to Trump's presidency have gathered for more than three straight weeks of rowdy nightly demonstrations. "We are so thrilled to finally be here at the 'Kremlin annex' on night 22," O'Donnell told the crowd, which responded with a cheer. "Let the president know in no uncertain terms that we are alive, awake, and we are woke. We are not going away!" The president was not at the White House during the protest, vacationing instead at his golf club in Bedminster, New Jersey. His job approval rating has consistently been underwater since he took office in January 2017. On Sunday, about three weeks after his widely panned Helsinki summit with Russian President Vladimir Putin, his disapproval rating stood at 54 percent, versus 41 percent approval. Jessie Harris, a 16-year-old from Herndon, Virginia, is too young to vote, but she said she came to the White House - draped in a Trump puppet costume - to express her dismay about the administration's actions on immigration. "I'm upset and angry at the way he's treated people... and I think this is the place to say your grievances and get it all out," she said. Several people in the crowd chanted "Impeach 45!" and "Lock him up!" Others held signs that read "The Lyin' King" and "Traitor to the Planet." John Aravosis, who has helped organize the protests, said he was stunned at how the movement has persisted. "After Helsinki, we saw how disastrous it was going," and when Democratic strategists suggested on social media that a message could be sent if people gathered en masse outside the president's window, "we all said, what the hell, let's show up," Aravosis told AFP. Trump has faced mounting criticism over his embrace of Putin, whose government is accused of interfering in the 2016 US election, and his verbal attacks on the media and the special prosecutor conducting the Russia investigation.